Here is another guest article on the liturgical theology by a recent college graduate, Mr Matthew Roth, who just finished his undergraduate studies at Franciscan University. Another positive sign for the future of the Church and Her liturgical life - young people putting serious work and thought into expressing their ideas about the theology of the liturgy. I recently had the opportunity to participate once again in the Sacred Music Colloquium of the Church Music Association of America, the sponsoring organization of this website. The week is many things. Firstly, it is liturgical, as the choirs principally prepare for liturgical performance of Gregorian chant and sacred polyphony. Secondly, it is instructional, as experienced music directors present on theoretical aspects of Gregorian chant, choral technique, playing the organ, history of church music, and working in the church as a musician. Thirdly, it is an event of community. It is the intersection of this point and of the singing of Gregorian chant and the liturgy that I wish to examine in this piece. The publisher of NLM and the CMAA president, Dr. William Mahrt, always gives a plenary lecture related to some topic anchored to the “musical shape of the liturgy.” Having grown up alongside the Roman Rite, chant is intrinsic to the ritual, not something that is truly optional, even though one may read the Mass texts or choose alternative music, whether it be polyphony, a hymn, or some other style of music. (In fact, with the first of these, one always refers back to the chant repertoire in composition and performance.) It gives expression to the text, as can be seen from a theoretical analysis of the melody, and it is always appropriate for the moment in the ritual. The Introit is perfectly suited for the entrance or the prayers at the foot of the altar, depending on whether the Mass is in the usus recentior or usus antiquior and whether it is a Sunday Mass or not. Singing a congregational hymn in four parts with a descant might be lovely, but it can distract from the ritual, nor is it the historical tradition of the Roman Rite. Another example is the Gregorian Alleluia with its long and intricate melodies which draw the worshiper into contemplation, and the complexity contrasts with the simplicity of the sung Gospel. Since I have summarized Dr. Mahrt’s point, and having borrowed his own examples in doing so, I now ask: if the liturgy is inherently musical, what does the sung liturgy mean for the Christian? How does that play out in our day-to-day lives? 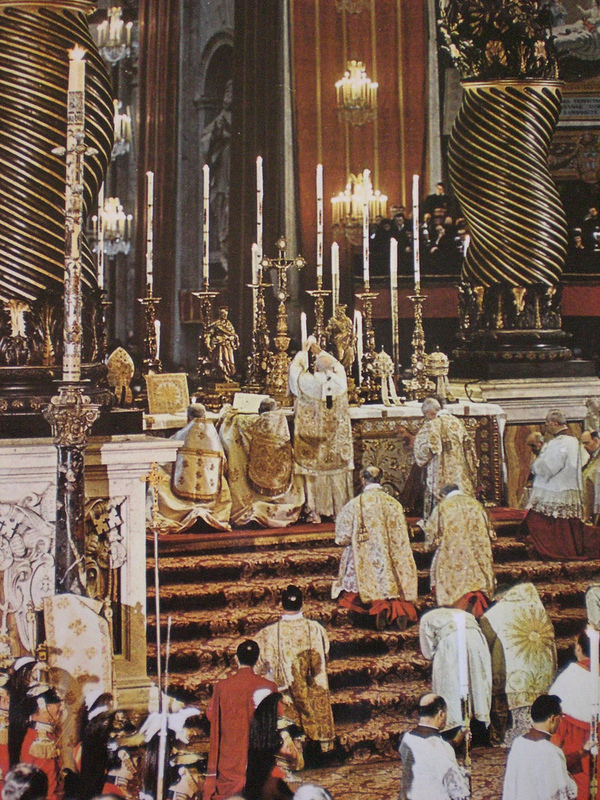 The liturgy in all its forms is “the summit toward which the activity of the Church is directed,” and “at the same time it is the font from which all her power flows” according to Sacrosanctum Concilium, no. 10. This is important, for the divine revelation is clear that we can only do good by the grace of God, chiefly found in the sacraments, which are acts of worship of God instituted by Christ for the reception of God’s invisible grace through visible acts instituted by Christ in some cases, and always confirmed and regulated by the church. 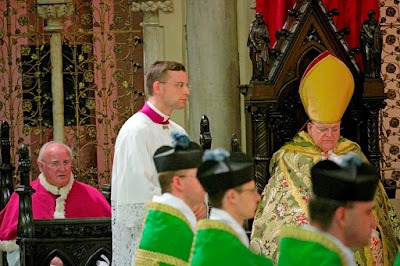 Sometimes, I have been told that the externals do not necessarily reflect the interior dispositions of the ministers and participants at the liturgy. This is a true statement, though I wonder if it is said in order to justify what is often called the “Low Mass mentality” of minimalism or, indeed, whatever is the preferred practice of the objector. (I apologize for having made something of a straw man in regards to what I assume to be what is really meant, but such is my experience.) In short, such love is given to the singing of Gregorian chant and to the proper celebration of the liturgy in accordance with tradition because it is how we have come to discover Christ, and it is how we are able to share him with others, to invite others to his person and to the almighty Trinity of whom he is the second person. Almighty, eternal God, grant unto us an increase of faith, hope and charity; and make us love what You command so that we may be made worthy to attain what You promise. The fulfillment of the Great Commission by worshiping well and by linking this worship to the works of mercy is one part of the exercise of the virtue of religion, which is giving God his due. This falls under the first and greatest commandment, to love God with all our heart, soul, mind, and strength. What comes in our own lives falls under the second commandment, to love our neighbors as ourselves. St. Athanasius, the great defender of the Nicaean doctrine of the Trinity, wrote in On the Incarnation that God “became incarnate so that we might be made god, and he manifested himself through a body so that we might receive an idea of the invisible Father…” That Christ was incarnate is no small matter. Man is a body-soul union, so in this life we use our senses in order to know. Increasingly I hold to the position that there is nothing in the intellect which is not first in the senses. The liturgy takes this by giving all sorts of sensory stimulation, from chant to bells to incense to images to processions. The sacraments do this and also make perfect that which is natural; for example, the bread and wine are converted into the body and blood of Christ while retaining the accidents of bread and wine. That they do so helps us to know, for bread is nourishing physically, just as Christ spiritually nourishes and is the source of physical nourishment. Christ also never loses his body, which is physically in heaven, but through the Eucharist he fulfills his promise to be with us until the end of the ages, and it is in the Holy Mass that we become united to him and to his church. As Joseph Ratzinger says in Introduction to Christianity, the “essential form of worship,” which he later shows is also sacrificial in nature, for a Christian is that of thanksgiving, and the Mass is the one sacrifice made by Christ the true and eternal high priest. 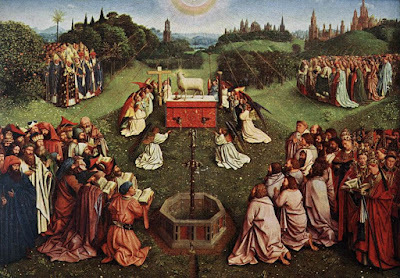 We offer the Mass not as the priest does in persona Christi, but in virtue of our baptism, by which we were brought into Christ’s death to have new life in him. By this, the moral life is a sacrifice; only when it is offered to God can it be considered as such, and it is thus connected to the Eucharist, which is the explicit blessing of God and offering to him not just anything or even our lives on their own, which is good, but we offer to him his beloved Son. It took another theological controversy, namely the Nestorian heresy, to establish that not only is Christ equal in substance (homoousios) to the Father, but that he is a divine person. God is a communion of persons who share complete and perfect love and who out of that love gratuitously created, redeemed, and continue to sanctify the world. The only distinction is that one is Father and the unbegotten eternal generator, the second is the begotten Son, and the third is the Holy Spirit who proceeds from the Father, who is the first principle, and from the Son. This relational aspect is what makes the persons of the Trinity persons, and not different modalities of God. From this, we must look at the human person, who is in the image and likeness of God, chiefly by having been created by a God who is all-good and by possessing reason, having been given it as a gift by God, who is rational. God makes a human a someone, a unique and unrepeatable person who has a soul united to the body. This soul and this material composition (more or less: contemporary understandings of matter somewhat complicate this point) are distinct from every other soul and composition. Further, the soul gives the person the capacity to freely know, love, and serve God and from there, to do the same to one’s neighbor. This is opposed to a something, such as a rock, which is only material, and although one might speak of having rockiness, and of this rock versus that rock, it is nevertheless a rock. It does not possess the dignity of the individual human person. It also contrasts to any dystopian distortion of the distinction between each human person. The person’s nature is perfected by grace at baptism, where original sin and any personal sins are removed, in order that the person can enter into communion with Christ and his body the church, especially via Holy Communion in this life. Now, the Fathers and medieval theologians tend to emphasize the corporate unity, but I think it is good to emphasize the union between one man and another rooted in the union between Christ and each particular person, for one does not lose his individual identity upon entering the church. Hannah Bruckner, a good friend from Franciscan University, wrote for the “Truth from the Heart” blog (especially dedicated to the philosophy of Dietrich von Hildebrand) that a lived personalism is “the ability to intuitively see the importance of an individual infinity within every human person” and that “there is truly nothing in this world more powerful than being seen by another.” I think the most efficacious way for this to come about is to sing the Mass and Office on a regular basis, for everything flows from the liturgy and must return to the liturgy, since in this life this is how everything comes back to the Trinity, the source of all which in the end will take all things up into itself. Chant teaches one to contemplate God, which allows one to be of better service to others and to be more generous of all that one has: time, abilities, material resources, etc. It makes one a better friend, one who is able to be genuinely interested in the smallest matters of a person’s life and to meet more people, seeing them as unique persons. I would also say that it makes one a better example as a Christian, not only in living an upright and moral life by God’s grace, but by being able to take one part of Christianity and of life and dwell on it for some time, sharing that plus 10% more each time. The Divine Office also teaches charity, for not only does one have to teach another to sing the office, but the rubrics also teach charity in the alternation of the psalmody to save the voice and in the courtesy extended to the cantors in waiting for them to return to their place before sitting (or for them to sit before continuing the verse). Finally, the life of chant redirects us to the Trinity, for we as friends are now excited to share this life with one another and to draw others into the worship of God. One might argue that the focus should be on the sacraments, namely the Eucharist, which effect an increase in the theological virtues, but I argue that the rites contribute to this increase by properly disposing us and orienting us (quite literally when worshiping ad orientem) towards that personal encounter with God that comes about through the sacraments. We ought to heed the words said to St John the Baptist by his father Zechariah, which are said every day at Lauds. We ought to serve, as John was called to do so, as “the prophet of the Highest,” to “go before the face of the Lord to prepare his ways,” and to “give knowledge of salvation to his people, unto the remission of their sins,” in relation to his life, death, and resurrection and of his second coming, and to “direct our feet into the way of peace.” By worshiping according to the tradition of the Church and by taking its spirit into every aspect of our daily lives, we will truly live liturgically.